My new painting is finished and ready for viewing. 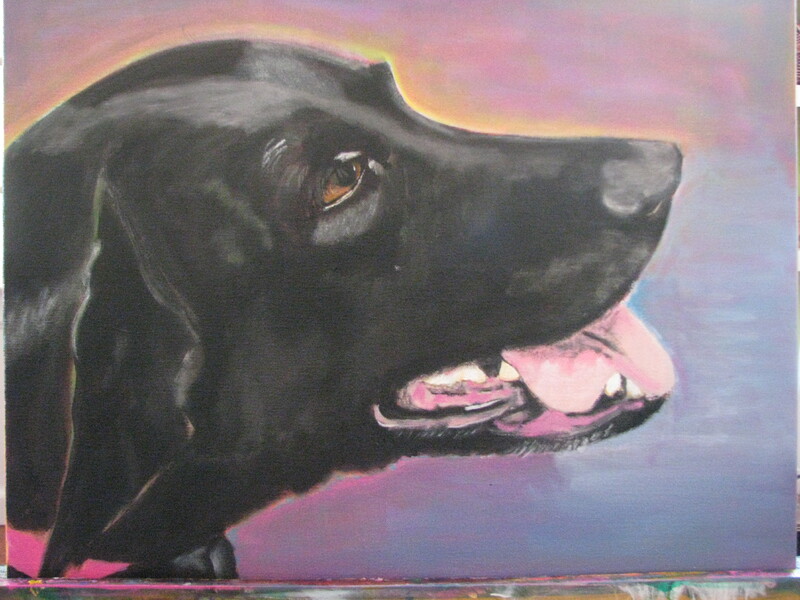 This is the painting that I gave you a sneak preview of a couple of weeks back. Her dreams kept multiplying and her basket is over-full with eggs ready to be counted. The little chick and the mamas are looking on. 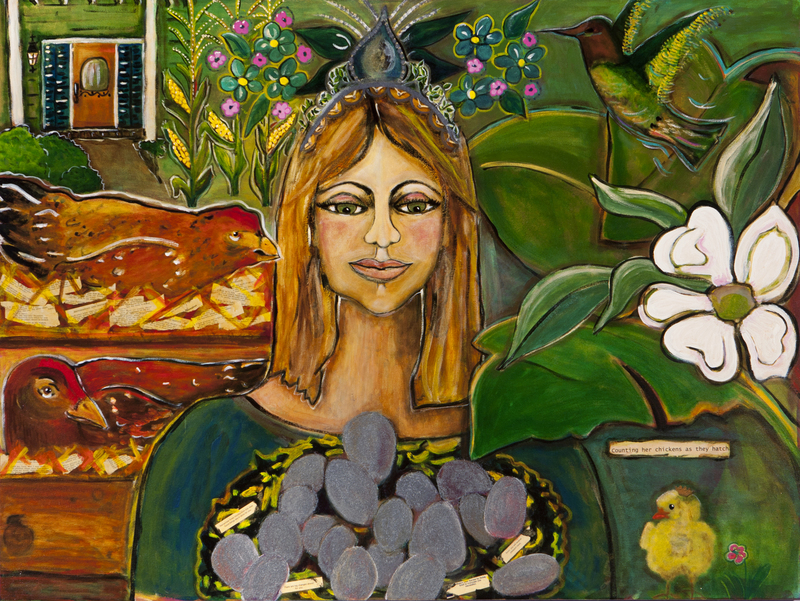 The theme is abundance. She is wearing a tiara but is unaware of her Goddess-ness. She is humble and hopeful. Humble and hopeful is how I am starting the New Year… as well as grateful. I hope all the best to all ya’ll in 2012. This is a very happy day for teachers and people related to teachers, the holiday begins! Good morning and Happy Saturday. 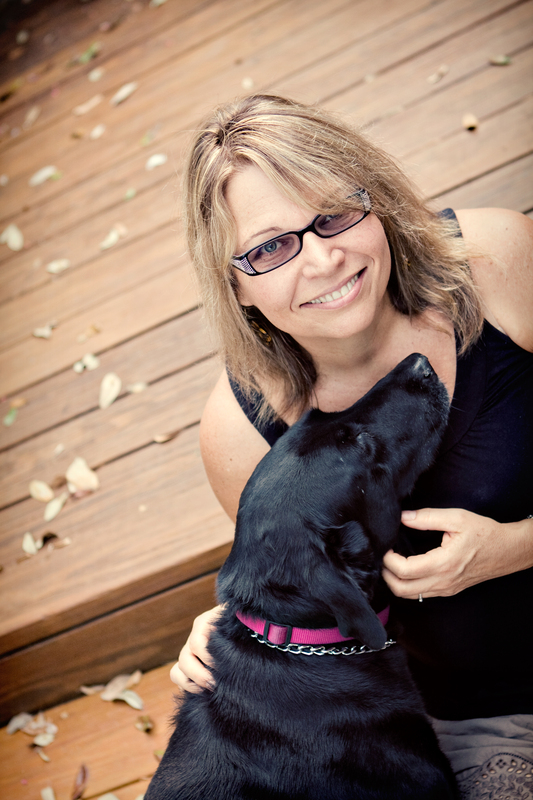 The fabulous Dorka of Dorka Photography took my most recent pictures. I hear that they are in the mail at this moment. I will be able to share what I have been painting right after Christmas. 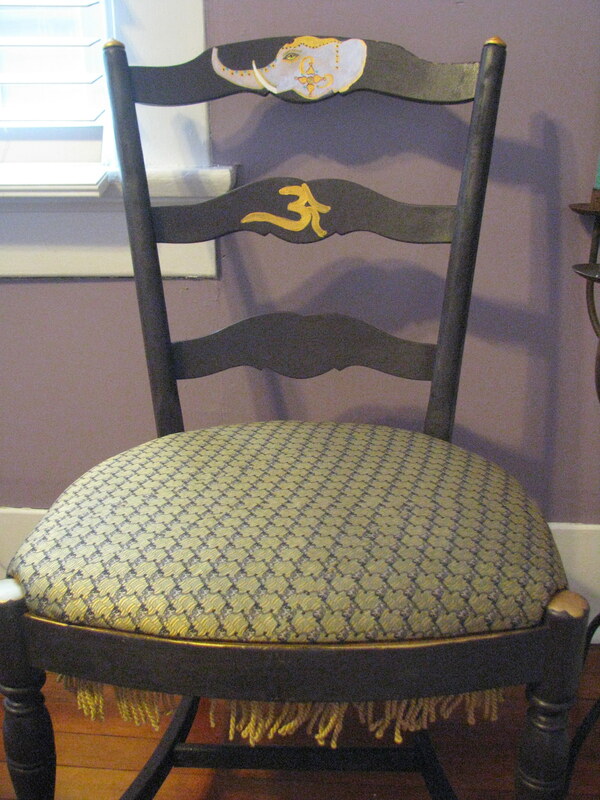 Today, I just finished embellishing some chairs. When I washed the 50 years of dinner guest magic off of them, the finish came off, too. I am thinking the previous owner, who has passed on, is thrilled with their reincarnation. I can still feel her lovely spirit when I look at them. I painted this chair eggplant purple. I thought an elephant would fit perfectly into the scroll top of the chair. I had this purple and gold material from making my daughter, Angie, some pants to wear in Turkey. One good thing about creating what you love is you have the materials around because you love them. I also had exactly enough gold fringe. 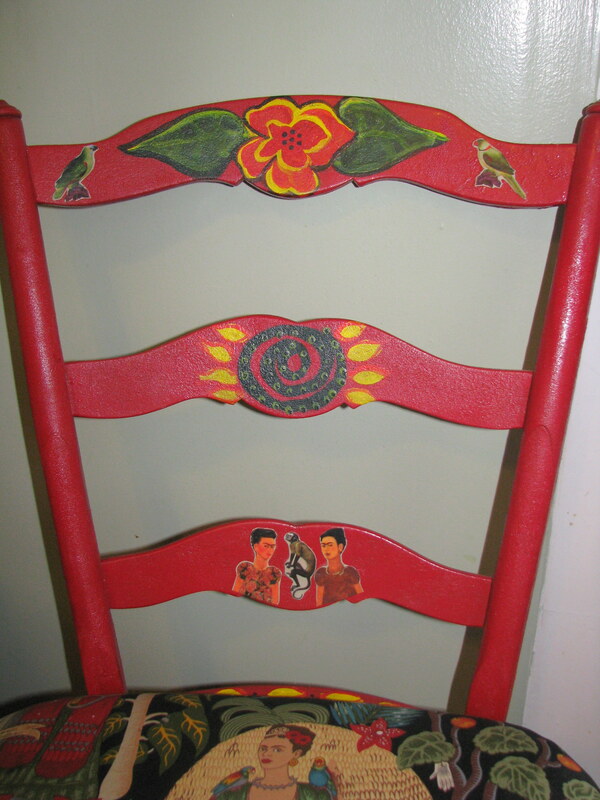 The next chair I embellished is a little Frieda Kahlo altar. 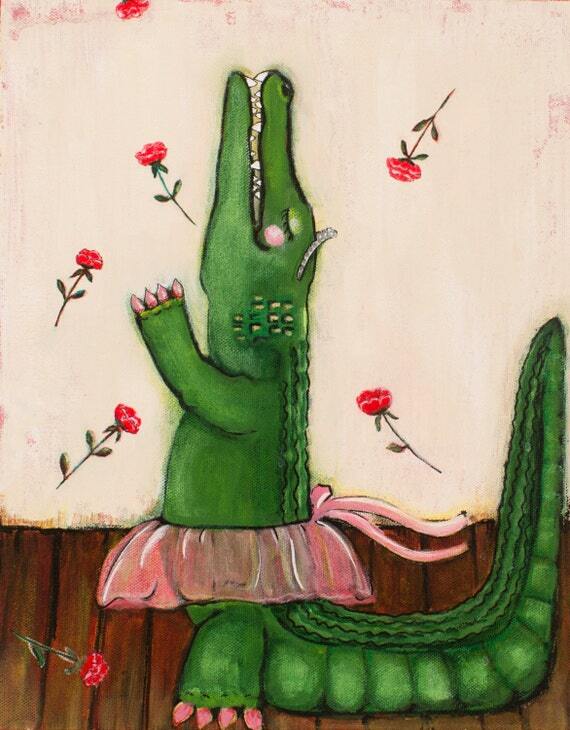 Miss Freida has been my main inspiration for my painting. I love her work and I also love her drive and determination to continue painting even when in great emotional and physical pain. If you have had relationships with other human beings, you can understand her emotional pain, but she was also hit by a bus! Mini Mags helped me with this next chair. I painted the chair blue and put the cool material on it. 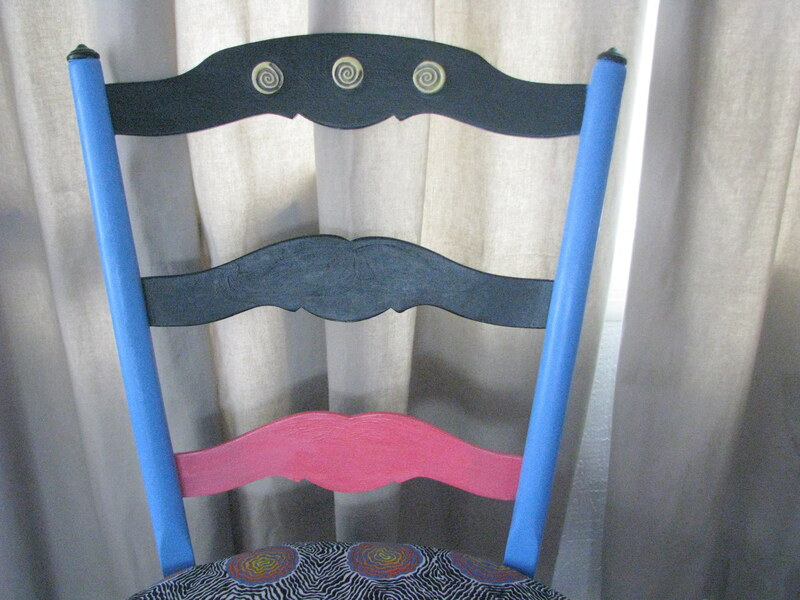 Then I painted lips and mustaches on the chair back. I didn’t like it and painted the mustaches away with my trusty white paint. Maggie and I decided on black and pinkish. (She always says pink.) While I was explaining that we needed to do something that would go with the material, she walked over to my shelves and picked up 3 clay pieces that my sister, Jan, just sent to me in our Christmas box. I didn’t even know MMMM looked on the shelves. They were perfect. Now I love the chair. For this last chair, I picked the paint first. I love green. Then I decided on a subtle Mardi Gras theme. 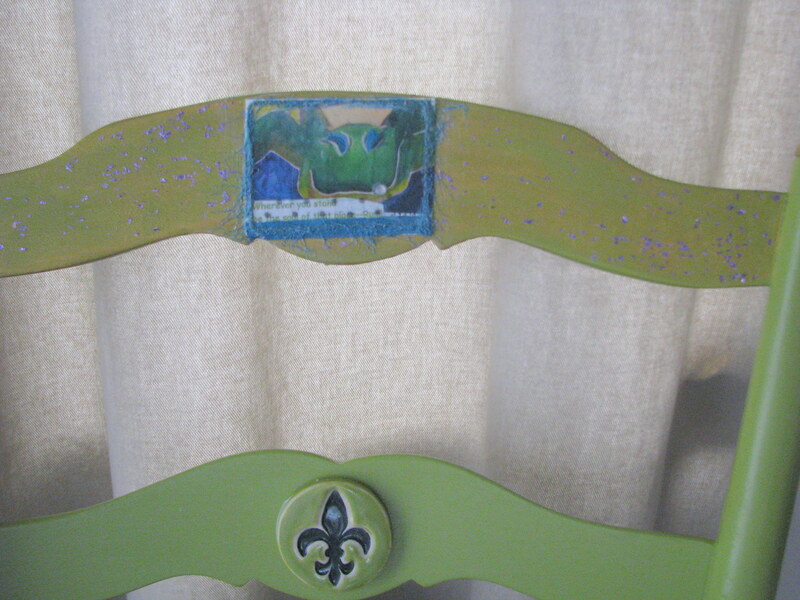 My sister sent me a clay fleur de lis that looked great. Then I put a trading card that Jan also made for me on the top. It has her moto on the card, “Wherever you stand, be the soul of that place–Rumi“. 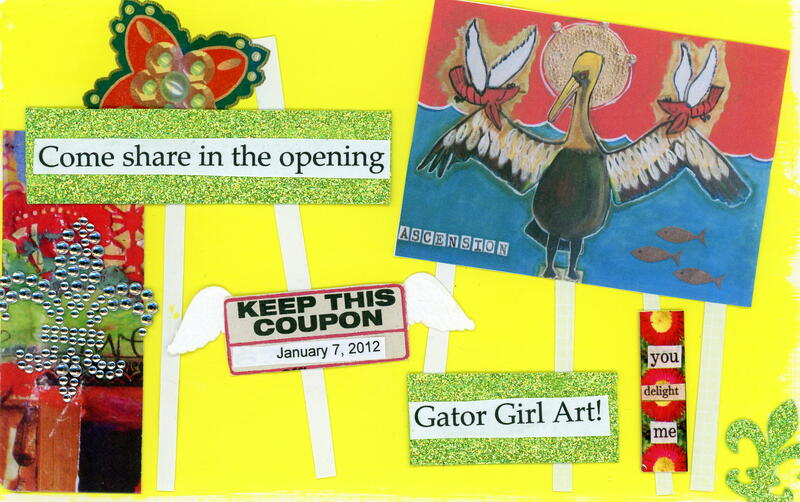 On the card is also my King Gator, who is saying, “Wager it all”. This chair to me is New Orleans, but also my sister. Green is her favorite color, too. If you think someone might like my blog, please ask them to follow me. If you are following my blog, you are invited to a party at my house. This is like my reverse retirement party. There will be food, drinks and mingling. I painted light and dark areas, blending into the medium areas. I didn’t worry if the lights were too light or that I can still see the words loving and loyal. A little more finished here, but looking too sad in her eye and pale. Here she is almost done. I like the light in her eye, but her tongue is too large and the light on her nose is too white. 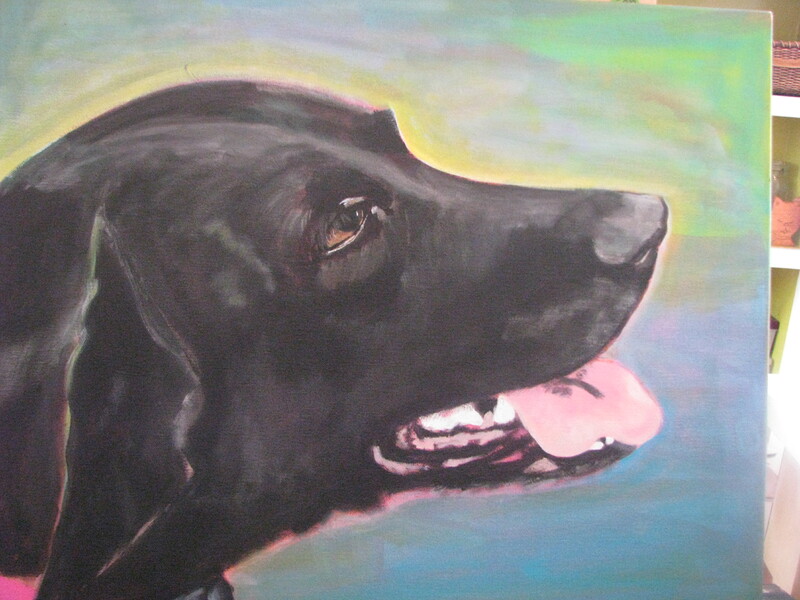 I painted white over some of her tongue and blended it into the background to sort of start over. After this picture, I just did a little touch up like they do with models and made the space where there is no tooth a little smaller. I think she was a little vain and would appreciate the illusion of better teeth. Mini Mags and I have been missing Brook. She was tragically hit by a car last week crossing Napoleon Avenue on her own between Dryades and Danneel. The car was a hit and run, but the people there were so nice. When we got the phone call, my daughter and son-in-law responded. The neighbors had Brook covered with a blanket and 5 people were petting her. She was rushed to Maple Street Small Animal Clinic. They fixed her up and x-rayed her. The x-ray showed too much muscle damage from old age for her to recover. It was a miracle that my clueless, little escape artist lived as long as she did. 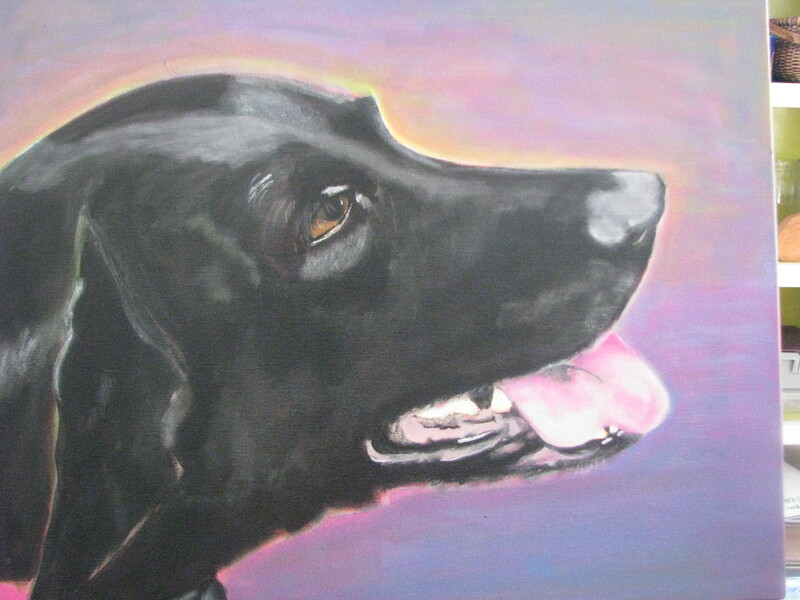 I should paint some little lab angels in her picture. My husband called her an anti-lab. She hated water, even to get her feet wet. She was afraid of guns and did not understand the concept of fetch. She was fetching, however. She loved to dress up, especially if she saw another dog wearing a sweater. Mini Mags and I were reminiscing about Brook, and Maggie in her infinite 3-year-old wisdom, said that I should paint Brook. At the risk of sounding loony-tunes, I am going to start talking about my process. I set the mood. 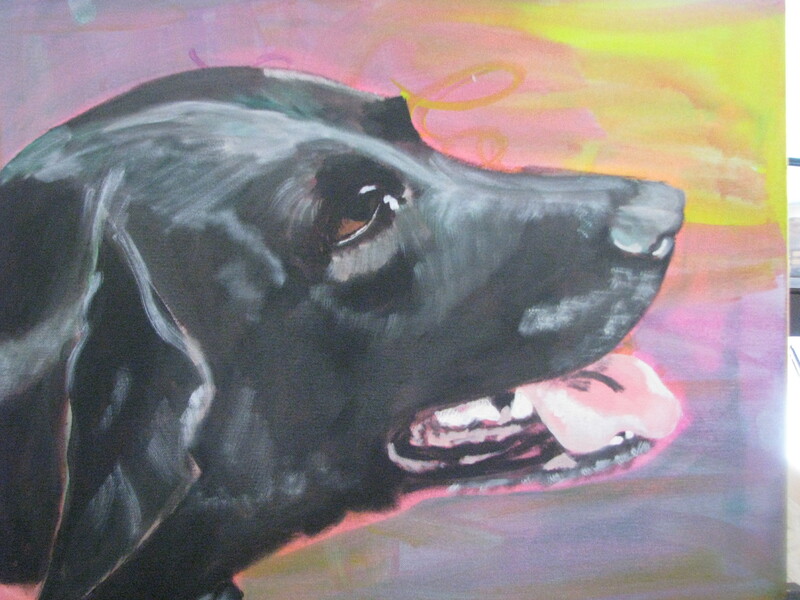 Usually, I play music that inspires me, but when I paint pets, it is unusually quiet. Search me, I don’t know why this is the case. 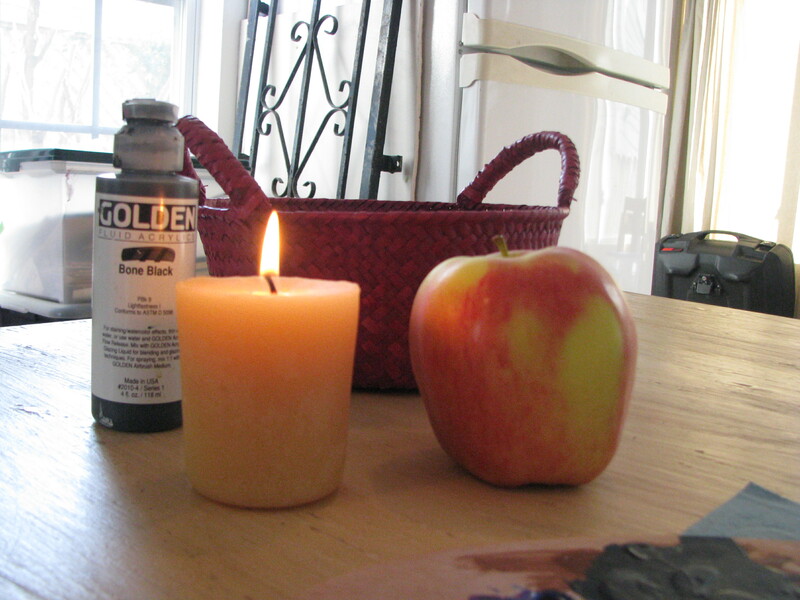 I light a candle, and for Brook, I put out some black and pink paint and her favorite food, an apple. I asked Brook’s spirit to help me paint her. Living or passed on, I feel the animal’s spirit happily respond to this. I guess it is just like an animal in life, eager and loyal. I picked 3 colors that I think Brook would like. 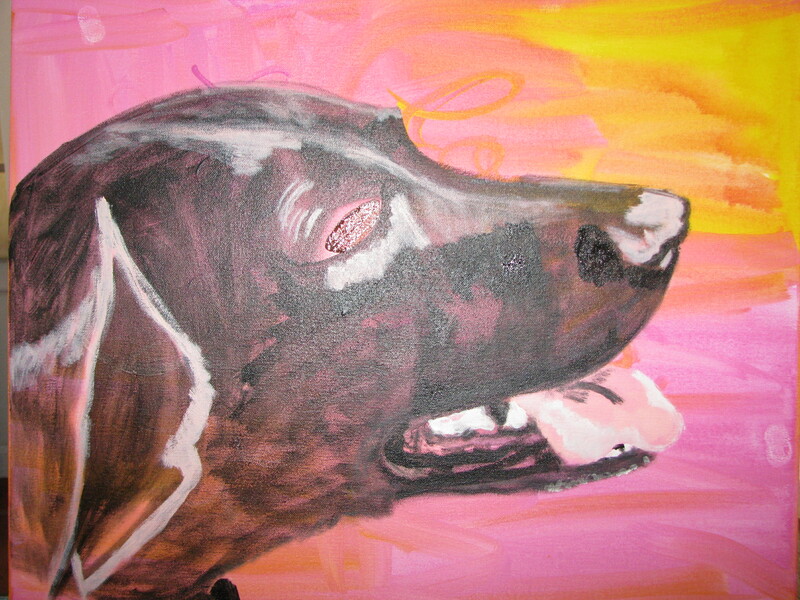 With Brook I picked hot pink, a color I always associated with her, pale pink and opaque yellow. 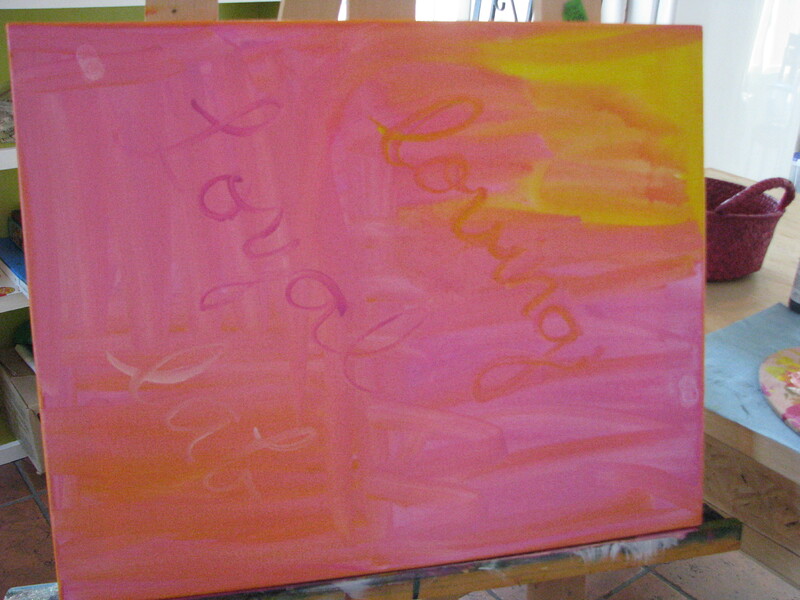 Then, I sprayed the canvas with water to make the paint go on easier and freer. I put the paint anywhere that feels right. I put the yellow near the top like a shining light and the pinks everywhere else. Then I wrote words on the painting. As it happens, all the time so far, the words placed themselves so appropriately. 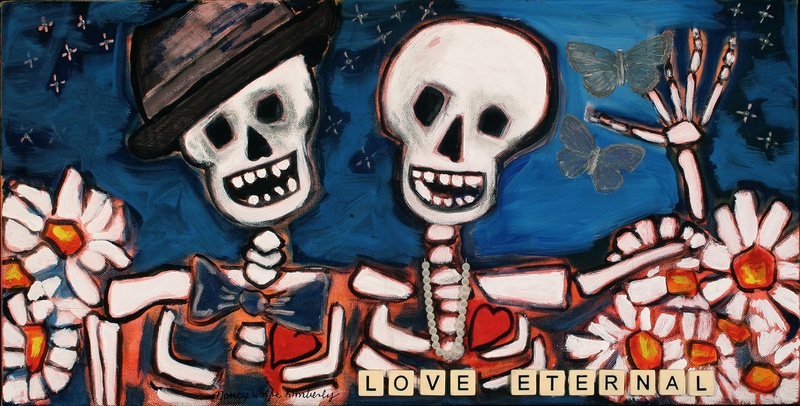 They went on like this: loving was near her tongue, loyal was near her brain and lab was by her throat. When I wrote the words, the canvas was vertical, and when I blocked Brook out, the painting was horizontal. I am just mentioning this to show how this just happens. The words are loving, Loyal, lab. Next, I painted Brook. I chose Black, but it could have been any dark color. I think I will paint the dark places on her coat in Dioxazine Purple and the lighter ones in Micaceous Iron Oxide, with Bone Black predominant. The great things about acrylic paints (I use Golden Acrylics) are the quick drying time and you can layer over anything that you try on. If it is a real mistake, paint it over in opaque white or gesso and start over. Just on the off-chance that you don’t want to read about painting Brook all day, I will insert a picture of the blocking here. And thanks for reading about Brook and my process. Stay tuned for the next step.